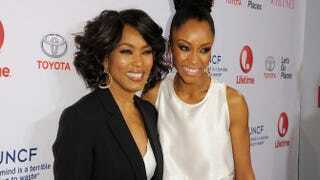 Director Angela Bassett and actress Yaya DaCosta arrive at the premiere of Lifetime’s Whitney at the Paley Center for Media on Jan. 6, 2015, in Beverly Hills, Calif.
Angela Bassett’s acting career has taken her from roles in which she’s known for setting a cheating husband’s car on fire to playing the fiery musical icon Tina Turner, but this year she has taken on a different type of role: that of director. Bassett is sitting in the director’s seat for Lifetime’s Whitney Houston biopic, Whitney, which airs this weekend. The movie, which stars Yaya DaCosta as Houston and Arlen Escarpeta as Bobby Brown, takes a look at the late singer’s life, starting from her rise to fame in the late 1980s. In an interview with The Root, Bassett explains how she came to direct the movie and what viewers can expect to see. The Root: Why did you pick Whitney Houston’s story to become your directorial debut? Angela Bassett: I was picked to direct the movie by the executive producer, Larry Sanitsky. We were having lunch one day discussing the movie, and I pitched him names for possible directors. But then I said, “Aww I wish I could direct it.” I wished I had the experience and a bit of a résumé in the directorial area. Here I am a newbie, and I thought there was no way this was going to happen. The executive producer later asked me, “You wanna do that?” Larry called me back a couple of days later and offered the job, but I asked if I could read the script first before I made a decision. I held on to the script and read it within a week. I had to ask myself, “Was I really going to direct this movie out of nowhere?” I read the script and thought it was wonderful and it felt like a love story. And now I have my directorial debut. TR: Did you approach Houston’s family about the film before, or did they approach you with objections about it? AB: We didn’t receive any pushback from her family. We tried to be neutral and fair when they made the decision not to be involved in the film. TR: What aspects of Whitney’s life did you choose to highlight and why? AB: We chose to begin the story when she was 24: 1989 on the evening of the third annual Soul Train Awards. That was the night she first met Bobby Brown. It was the height of her career. Her beauty and talent were substantial. There was speculation and opinion on if Brown was the right one for her. Within the short period of time, they became a family. Then there was her film career with The Bodyguard. It was the first time a black woman was the object of affection on the big screen. So much was going on in her life during this time [the ’90s]. It was also the beginning of the public’s awareness of her involvement [with] drugs. There was a lot of complexities and drama. TR: During your time with Whitney on Waiting to Exhale, what shocked you the most about her personality? AB: Nothing shocked me. You go from being a fan and being on the outside. You see this bigger-than-life persona. But when I got to know her, there was no diva attitude. She was professional and laughed easy, and we would hang out and bond to get to know each other. She was a down-to-earth person like everyone else. TR: What was the process in picking DaCosta to portray Houston? AB: Visually she was a no-brainer. Then the question was, can she convey the essence of Whitney? Is she as arresting? Did she have that “it” quality? When she auditioned we saw all of that, and it was so. There was no conflicting back-and-forth. And then there’s Arlen Escarpeta; there was a chemistry and spark between them. And that’s the best you can hope for. TR: Not too many people have asked about Bobby Brown’s portrayal in the movie. What was the one thing you wanted to make sure to portray? And how did Escarpeta capture that? AB: Bobby was a fighter and loved Whitney to the end of time. He had the heart of a fighter. He loved and fought hard. I want people to see both of their perspectives. I want them to see the effect that loving the most popular woman of all time had on Bobby. Their relationship was loving but tumultuous. We all have issues. We either deal with them privately or publicly. And unfortunately with a life in the spotlight, everything is public. TR: Now that you have your first directorial project under your belt, what’s in store for your second? AB: Friends have said this movie will change everything. But who knows if there will be other offers. I’m proud I’ve had this as my first. TR: You’ve gained tons of new fans and somewhat of a cult following since you’ve been on American Horror Story, and your characters have been amazing. Do you think you’ll be returning for a third season? AB: I really don’t know what the next season holds. So I can’t really say at this moment. But I do appreciate the new fans I’ve gotten since being on the show. Right now we don’t even know what the theme of the next season will be, so it’s all up in the air. You can watch Bassett’s directorial debut on Lifetime’s Whitney when it airs Saturday, Jan. 17, at 8 p.m. EST/PST.